Signed in Script on the Arm: J. & W. Grunow, New Haven, Ct, No. 101' . It is also stamped on the foot (in individually stamped block letters): O. A. White. 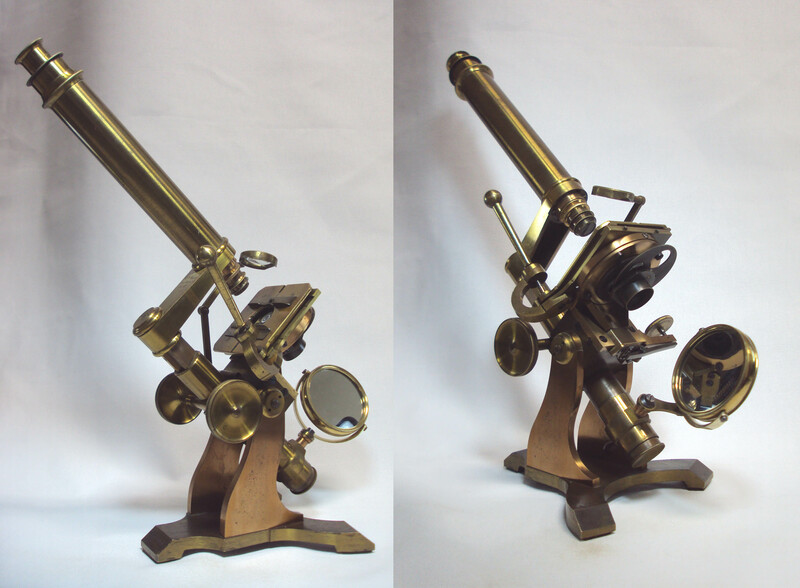 This is a fairly well-built, bar-limb microscope incorporating several features that became trademarks of the Grunow Brothers, as they frequently incorporated these features into their stands. It erects on two 1/4 inch-thick plates on the general plan of the Ross bar limb. Coarse focus is by a straight rack and pinion to the triangular bar. Fine focus is via an unusually located long-lever substage mechanism which acts upon the entire stage itself; the entire stage is fitted to the limb on a large dovetail fitting with a strong spring pushing it downward. The long lever fine adjustment is actuated by a vertical fine screw on the left side under the stage. This is a much more satisfactory fine focusing mechanism than a short nosepiece fine adjustment, and should not be confused with a tilting stage fine focus (which Grunow used on some of their smaller and cheaper stands), which is less precise and less satisfactory with high powers. 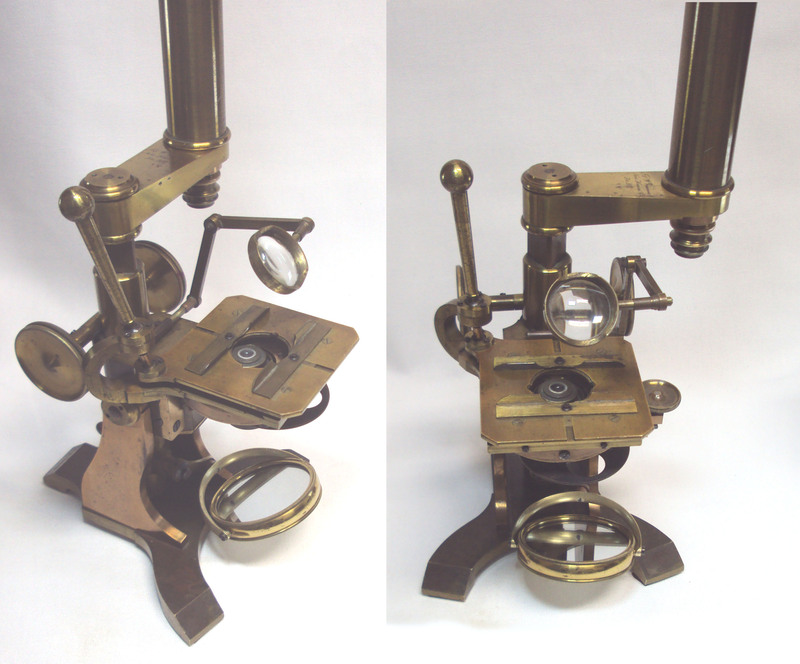 The microscope is equipped with a White-type Universal lever stage which was found on almost all of the Grunow's early models, unless another type was special ordered. The White lever allows movement in any direction, via the use of the dovetailed plates mounted at right angles to each other. The entire lever stage also rotates. 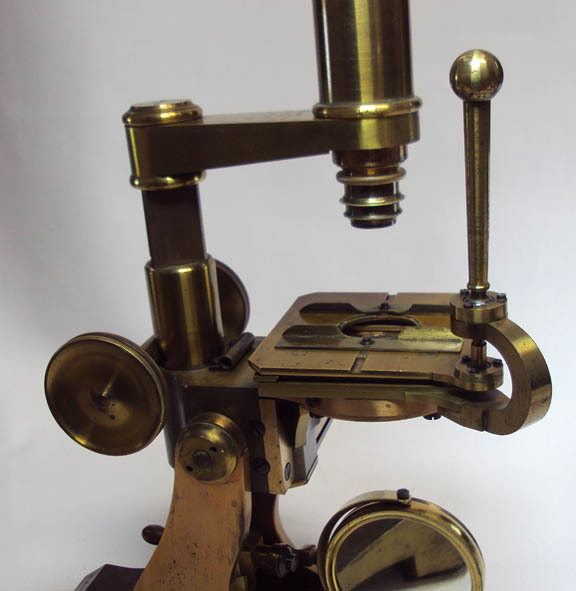 This type of rotation to the stage was invented by Joseph Zentmayer shortly before this microscope was made. In addition, the stage has sliding and rotating slide holders which are slid forward and backward, each attached by a single midline screw to dovetail fittings machined into the stage. The main arm carrying the optical tube swings out of the way for easy access to the stage, or for changing the objective. 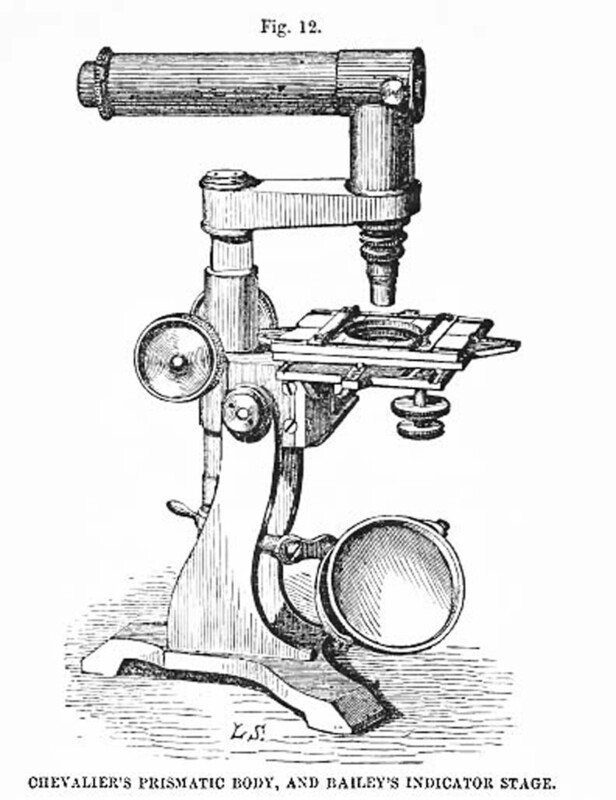 The optical tube is attached to the arm via a bayonet fitting; the Grunows intended for this to be easily removable, and therefore converting it to a dissecting microscope by substituting a simple lens or, for horizontal work, a Chevalier-type of right angled tube as shown in the accompanying engravings below from the 1857 catalog. There is no draw tube on my example, although the 1857 catalog mentions one. There is a single eyepiece and a single objective still with the instrument. The original case is missing. 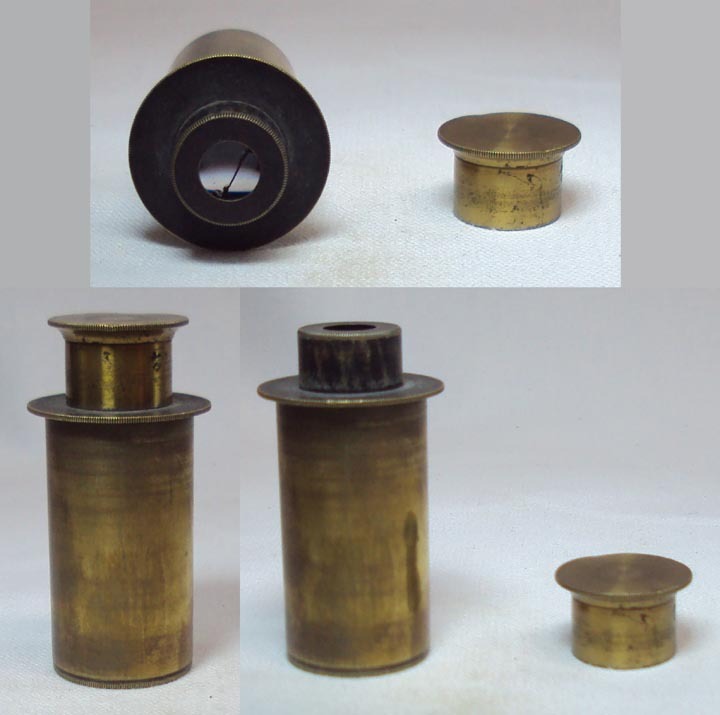 The eyepiece has a brass 'top hat' type of dust cover. The upper glass lens element of the eyepiece is cracked, but despite this the microscope is usable and produces a good image, with a slight blur in the center of the field due to the crack. The objective attaches by a bayonet fitting, and the substage achromatic condenser also attaches by a (larger) bayonet fitting. There is a removeable, and relatively small, articulated bullseye condenser attached to the limb immediately in back of the stage; it allows illumination from above for opaque objects. The overstage bullseye condenser has three articulations. Attaching its base-rod to the microscope stand, the rod can be pushed in or pulled out; additional centering is possible by a similar rod on the condenser itself, attached to the far end of the articulated arms. The bullseye has a curved cutout, allowing it to be placed very close around the objective. The microscope can incline all the way to a horizontal position if desired. Tension on the inclination joint is easily adjusted. The mirror is gimballed and articulated, the outside diameter measuring about 2.5 inches. The microscope came to me missing its original mirror and mirror casing; the mirror fork was present; the mirror present now is a 19th century English mirror of the same diameter as the original. The only weakness in the design of this stand I can find, is that the fitting which holds the pinion against the rack is only held in position by four screws from below rather than encasing the pinion from above and below; this makes this fitting more liable to be bent if the microscope is dropped or the coarse focusing wheel is bumped, and indeed the fitting of mine came bent and not in contact with the rack. This was easily straightened and realigned, but could have been designed better. 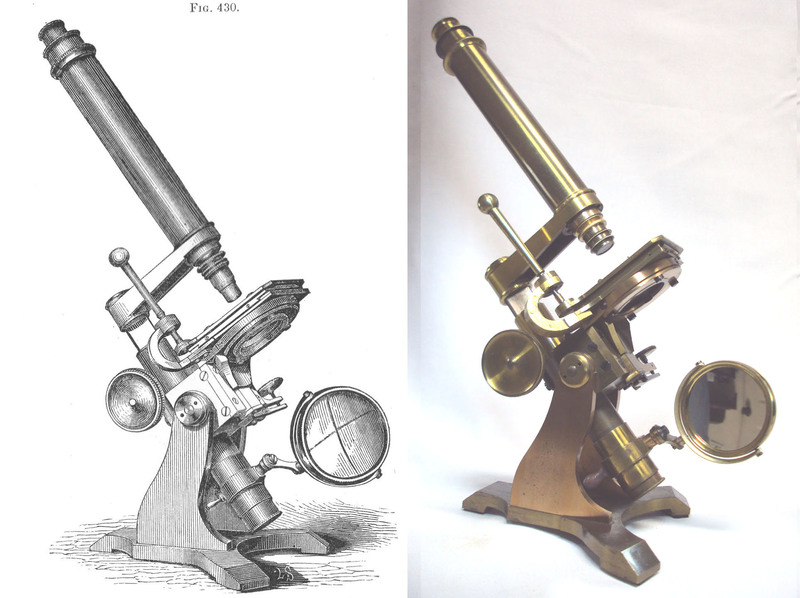 As noted in the 1857 catalog, the microscope as equipped here is the standard configuration. It could also be ordered with options which included a traditional graduated mechanical stage, a plain stage, and the Chevalier-type right-angled optical tube (see below). J. Grunow was already a 'mechanic' (machinist in modern jargon), when he emigrated from Berlin in 1849. He settled in New Haven, Connecticut and constructed his first microscopes for Drs Gilman and Van Arsdale in 1852. Around that year, his brother W. Grunow also came to America and joined him. Microscopists of the day apparently went to the Grunows for microscope construction, and the first practical binocular, invented by Ridell of the University of Louisiana was constructed by them. They were also apparently the first to make Dr Lawrence J Smith's invention of an inverted chemical microscope. 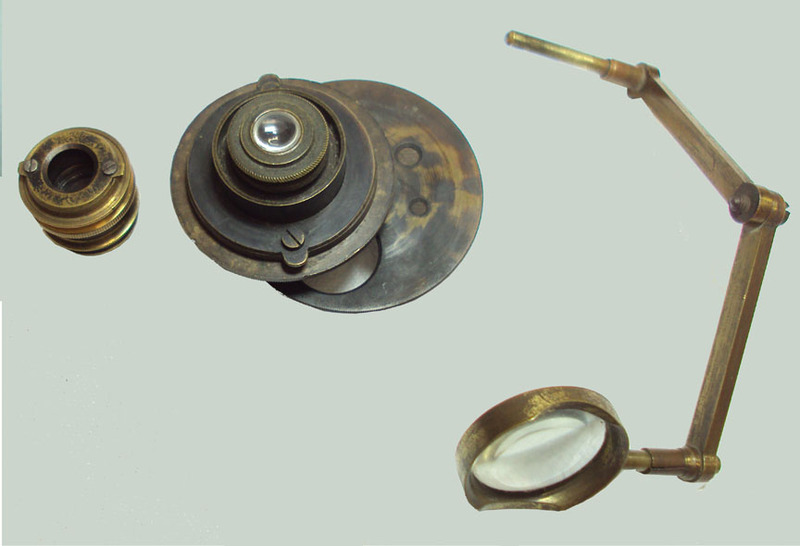 Examples of both of these are in the Billings collection, including the original versions of both the Smith inverted microscope, and the Riddell binocular. The latter was donated directly by Mrs Ridell to the Billings collection. The Grunows were also among the first to incorportate a disc of apertures directly into the top of the stage, although in this model, this is part of the substage achromatic condenser. Options offered in the 1857 catalog included a more traditional mechanical stage, and instead of the usual optical tube, a 90 degree tube of the the 'Chevalier' type, both shown in the engraving shown to the right. . Since the optical tube attached via a bayonet fitting, substituting another tube was easy. As Grunow's also mentioned, it also offered the opportunity to apply a simple lens in place of the long tube, for use as a dissecting microscope. Known serial numbers range from 56, for Smith's chemical microscope, said to be made in 1855, to over 1000. Francis G. Smith authored an appendix for the American 1856 edition of Carpenter's 'Microscope and its Revelations.' In this book, he refers to this microscope as the Grunow's first class microscope, with brass mountings and all the accessories (Fig. 430). 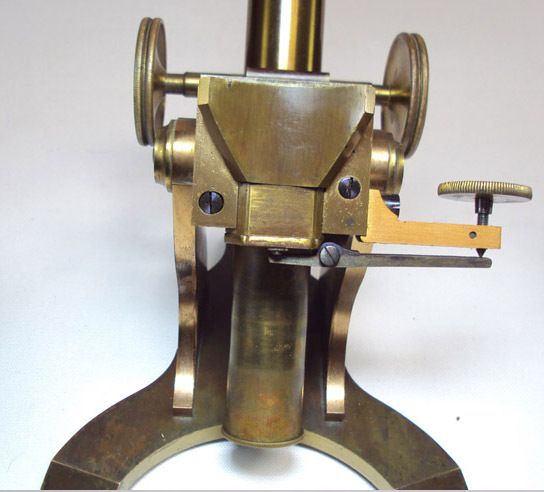 He neither pictures nor mentions the slightly larger microscope in the Grunow 1857 catalog. 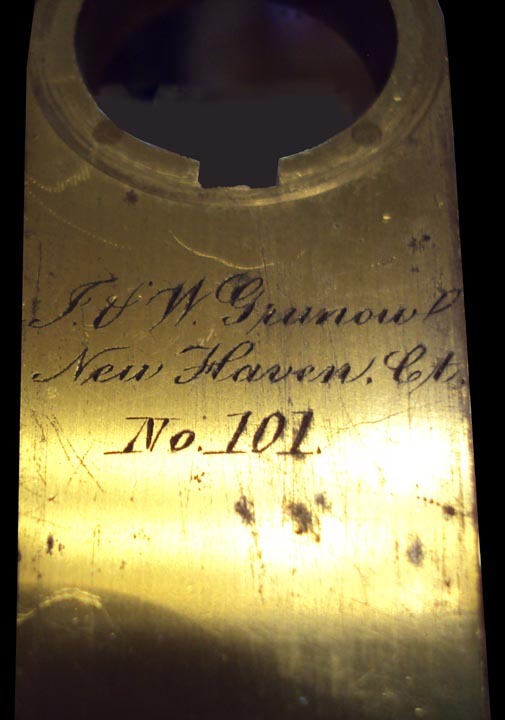 It is likely that this was the biggest and best of the Grunow's microscopes at the time Smith wrote his work. The sliding dovetail stage fine focusing mechanism is apparently a Grunow innovation, although I am not aware it was used on later models. Instead Grunows turned to other methods, especially the practice of casting a protruding ledge as part of the limb to house the fine adjustment knob. The location of this lever varied. It can found lower on the limb on simpler models where it controlled the stage (see the East Caroline U collection example here), or from the upper portion of the limb to control the focusing block, as in the smaller and later Grunow in this collection here. The method of control from the upper limb was also used on other more complex models. Another example of that location can be seen on a spectacular lacquered brass binocular model at Alan Wisner's Website here. Grunow also used the nosepiece short lever fine adjustment on some of their early stands as shown on another example at Alan Wisner's site, and later for cheaper stands, they also used a tilting stage fine adjustment, tilting the stage from the side as in this example on this website. The latter should not be confused with the control of the stage from the rear, which is a much more refined and precise mechanism engaging the stage which rides up and down a dovetailed fitting; in the later andcheaper stand, the mechanism simply tilts the stage sideways. 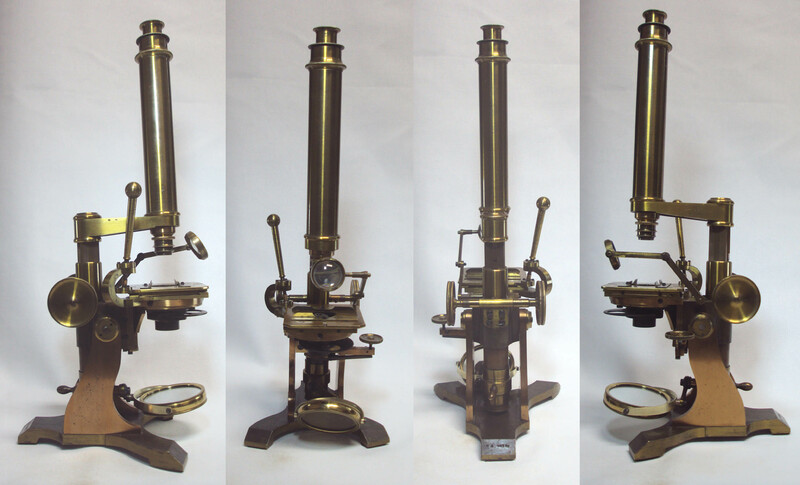 Known serial numbers range from 56, for Smith's chemical microscope, said to be made in 1855, to over 1000. Grunow's Production was relatively limited over the years and it has been said they only made about 1000 stands through their entire 40 year business, making their stands much less common than, for instance, Bausch & Lomb. Grunows moved to New York City sometime between 1861 and 1864. 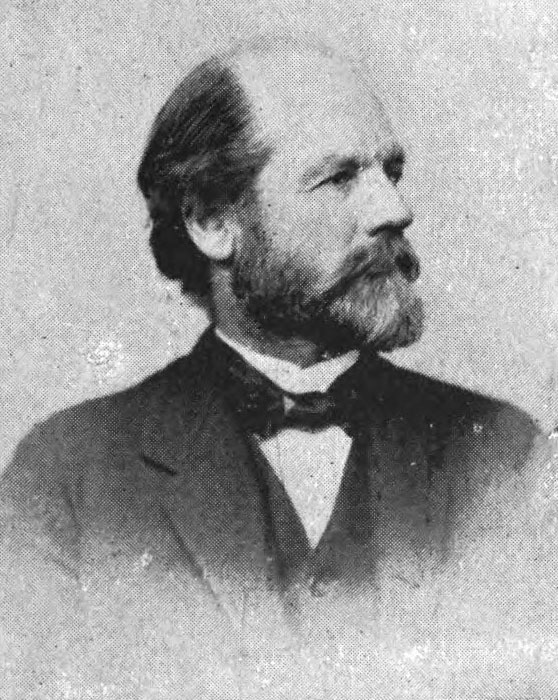 J. Grunow took over the business of microscope production in about 1874. Based on the signature (J & W), this dates this instrument to after 1861-4, but before 1874. The Grunow business ended about 1892. Grunow's Production was relatively limited over the years and it has been said they only made about 1000 stands through their entire 40 year business, making their stands much less common than, for instance, Bausch & Lomb. Grunows moved to New York City in 1864 or so, and the business ended about 1892. According to the 1857 catalog, all the microscopes of 1857, except for the very largest, and a portable, were referred to as 'student' types. The microscope seen here is one of the largest, heaviest and most complex he offered at the time, second only to Grunow's very largest instrument. As noted above, the microscope featured on this webpage was likely his highest class instrument before that time. I am aware of only one other surviving example, in a private collection. Dr. Octavius Augustus White, the likely owner of this microscope, was a native of Charleston, South Carolina. He practiced in Charleston from sometime after his graduation from the South Carolina Medical College in 1848, until the outbreak of the Civil War in the 1860's. He then became a surgeon in the Confederate Army in the third S.C. Batallion. During the Civil War, he was credited as providing heroic levels of care to both Confederate and Union Soldiers. After recording his observations of microscopical findings in the urine of patients with Yellow Fever in 1858 (perhaps with the above microscope), he was one of the contributors to a publication on that subject published in 1861. He eventually became well known as an expert in the diagnosis and treatment of Yellow fever and authored the reports on the epidemics of Yellow fever in Wilmington, SC and Savanah GA. In 1859 he published a paper describing his invention of a type of hysterotome for treating painful menstrual periods due to narrowing of the cervical canal. He also is credited with inventing a prismatic laryngoscope. Interested in the venous pulse waveform, he invented a 'haemarusmascope' for its measurement. He also invented novel surgical instruments for treating varicoceles and hernias. He was elected to membership in the South Carolina Medical Society on December 7, 1868, and to many other societies, including the N.Y. Academy of Medicine later. Dr White was also a talented, self-taught artist. Some time after the war, he relocated to New York City where he lived and worked as an accomplished and well-known physician for thirty five years, until his death aged 78. In the New York Times, a tribute after his death called him a 'Yellow Fever Expert.' He correctly surmised that the source of yellow fever came from ships which had stopped at other ports, but mistakenly thought that quaranteen would have prevented the outbreaks. In reality, the slaves and other travelers were carriers, and mosquitos biting the victims already on board, would spread the disease, their breeding sites unabated. It would not be until about 1900 that Walter Reed and Carlos Finlay would prove that yellow fever was viral in origin and spread by mosquitos. Their mosquito abatement program in Cuba was highly successful at stemming the epidemic. A highly effective vaccine was developed in the 1930's, still in use today. Unfortunately to this day, there is no effective treatment, except supportive care, for Yellow Fever. At the time of his death, Dr White was living at 1011 Madison Avenue. As can be seen in perusing the literature of his day, he published many scientific papers and was widely quoted and respected. Porcher, Francis P. Prize Essay: Illustrations of Disease with the Microscope, Clinical Investigations...Published by the South Carolina Medical Society. Evans and Cogswell Printers. 1861. p 120, 128. White, Dr. O. A. Description of a New Hysterotome for the Cure of Dysmenorrhea. Charleston 1859, as quoted in the British and Foreign Medico-Chirurgical Review or Quarterly Journal of Practial Medicine and Surgery, Volume XXV, Jan to April of 1860. White, Dr. O. A. Description of a New Hysterotome for the Cure of Dysmenorrhea, Invented by Dr O. A. White of Charleston, S. C. Charleston Medical Journal and Review. Vol 14 p451-456 1859, (with illustrations). Anonymous. Dr Octavius A. White Dead. Famous Yellow Fever Expert and Physician Passes Away in his Seventy Eighth Year. Published in the New York Times, May 26, 1903. Comittee of the Medical Assoc of New York City..Report of the Committee of the Medical Association of New York City on the Death of Octavius A. White, A.M., M.D., L.L.D. American Medicine (Correspondence) p975. 1906. Eliot, W G. Portraits of the Noted Physicians of New York City 1750-1900, with a few facts in the life of each. Vol.1. American Biological Society. 1900. White, O.A. Report upon Yellow Fever as it appeared in Savannah, Georgia in 1876. N.Y. Medical Journal vol XXV 1877 p249-273. White, O. A. The haemarusmascope. Am J of Medical Sciences Vol74 July 1877. p133-137.